Search engines take a number of signals into consideration when serving results to provide the most relevant and useful content to searchers. Though many elements of a website affect where the site’s pages rank, a website’s authority – its digital reputation as a trusted, reliable source – is certainly something that contributes to how high or low it appears in the Search Engine Result Pages (SERPs). Building a strong backlink profile is a close second in importance to building your website’s authority. Many website owners have the “if-you-build-it, they-will-come” mentality when it comes to building or earning links. If you create great content, you don’t need to worry about links because people will link to it and share it naturally, right? Well, yes and no. Publishing compelling content surely increases the likelihood of users linking to it and sharing it on their own, but to make the most of the great content you create, seek opportunities to build and earn links. Instead of writing a traditional guest post for another website’s blog once in a while, consider contributing to a blog or website with multiple authors on a regular basis. Also, use press opportunities to build links. Services like the free Help a Reporter Out (HARO) invite experts to connect with writers seeking sources for stories. Distributing news releases also can help build a diverse link profile, as long as you’re releasing something that is actually newsworthy. Because search engines penalize websites for bad backlinks, removing unfavorable links is just as important as building good ones. Every so often, check out what sites are linking to your content by analyzing your backlink profile, using a tool like Moz’s free Open Site Explorer. Look for links that appear unnatural, such as links coming from sites irrelevant to your business or industry, site-wide links, or links from any known link-broker sites. To get rid of these links, contact website owners explaining that you would like the link removed. Though this is a manual process, it’s necessary to maintain website authority. External links are not the only links that contribute to a website’s authority; internal links also play a role. Build internal links by linking to related pages from your home page, product/service pages, and blog posts with natural-looking anchor text. Internal links not only help boost authority, but they make for a better user experience by pointing viewers to other useful and relevant content. Like internal linking, other factors contribute to a positive user experience that can improve your website authority. For example, a mobile-friendly design is now critical. Google recently announced that it will include mobile-friendly usability in its ranking factors. Not having a mobile-compatible site not only provides a bad experience for those who visit your site, it now stifles the growth of your site’s authority, too. Additionally, your site should be fast. Though site-load speed seems like a small thing (and it is in the scheme of signals used to rank content) – it can have a big impact on user experience. If your site takes more than just three seconds to load, 40 percent of visitors will desert the page, increasing abandonment rates. You want users to get to your site, consume your content, and share it with others – but slow page-load time will stop some of those users in their tracks. Many website owners use social media to build brand awareness and post content – both tactics that can eventually increase authority. But you can effectively take it to the next level by seeking users and brand advocates to share and engage with your content, which can result in a more significant impact. If you post on social media sites but have no “likes” or followers, what good does that do? Not much. As a result, building your social media presence by engaging with users is imperative. Don’t just send a tweet or post a link to Facebook and hope others will share or find your social profiles organically. Seek people who are discussing similar topics and form relationships. Once you have built a following, be sure to engage with your audience regularly – and not only by posting links. Ask open-ended questions, have a poll, or hold a contest to grow the relationship and build trust. When users trust you, they will be more apt to share and engage with the content you post. Finally, technical SEO is an extremely important aspect of building and maintaining your website’s authority. You can publish the best content, have an amazing social presence and a beautifully designed website – but if the technical SEO is off, your website’s authority most definitely won’t grow. Though mapping your URL structure may be tedious, it’s necessary for search engines and users to successfully navigate your website. And the same goes for meta tags, title tags, headings, keywords, image optimization, and other on-site SEO factors: They all play a role in both search engine rankings and user experience, thus contributing to website authority. Overall, boosting your website’s authority is an ongoing process. You should continually produce and publish high-quality content, and use that content to build a robust back-link profile. Additionally, work to employ an internal linking strategy and check your website’s back-link profile often to stay on top of potentially harmful links. Also, keep user experience top of mind. After all, your website – content, design, and everything else – should be created for your users first, search engines second. With that in mind, work to build a strong social media presence that allows you to build relationships with your audience, while keeping technical SEO in check to successfully boost your website’s authority. 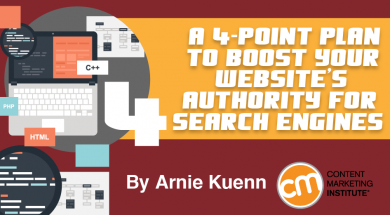 What tips do you have for website owners looking to grow their website’s authority? Let us know in the comment section below. Given the first step to being a website authority is great content, become more authoritative by listening or reading the Content Marketing Institute’s 10 Steps to Creating Better Content in 2015 webinar. Please note: All tools and recommended service providers included in CMI blog posts are suggested by the authors, not the CMI editorial team. No single post can provide all the relevant tools in the space. Feel free to include additional tools in the comments (from your company or ones that you have used).